To create iPSCs, adult cells are exposed to “reprogramming factors,” or transcription factors, thought to be important for pluripotency. Researchers have tested different groups of reprogramming factors, and originally four different factors were found to work best. However, the process is rather inefficient; only a very small percentage of cells exposed to the set of factors actually becomes reprogrammed. Shinya Yamanaka’s group, one of the two that first created human iPSCs, found that iPSC generation increased by up to 20% in cells without p53 (Hong et al., 2009). Other groups have reported similar results; cells with non-functional p53 mutants, or mutations in the p53 pathway, had increased reprogramming efficiencies (Utikal et al., 2009; Li et al., 2009), some even with fewer reprogramming factors than are usually needed (Kawamura et al., 2009). Some researchers speculate that p53 is acting to protect the cells from the DNA damage that the reprogramming factors can cause, as p53 is turned on immediately after the factors are introduced (Kawamura et al., 2009). For a more detailed review of these papers, check out (Dolgin, 2009). Overall, these many separate recent reports clearly show the importance of p53 in creating iPSCs. As a side note, a very interesting remaining question is how exactly these cells become pluripotent after bypassing p53 activity. What are the implications of the fact that decreasing p53 activity greatly increases iPSC derivation? It could imply that just about any cell in the human body has a greatly increased potential to initiate a cancer by losing p53 activity. Interestingly, this actually runs counter to the cancer stem cell hypothesis, which theorizes that not just any cell, but specifically a rare stem cell, may gain mutations over time and give rise to some cancers (see Figure)(Kawamura et al., 2009). This is a somewhat frightening prospect, suggesting that a far greater number of cells have tumorigenic potential than believed by the stem cell hypothesis, though it may help scientists better understand how cancer develops and consequently how it can be successfully fought. The cancer stem cell hypothesis (top) theorizes that a (rare) mutated stem cell may gain mutations over time and give rise to cancer. 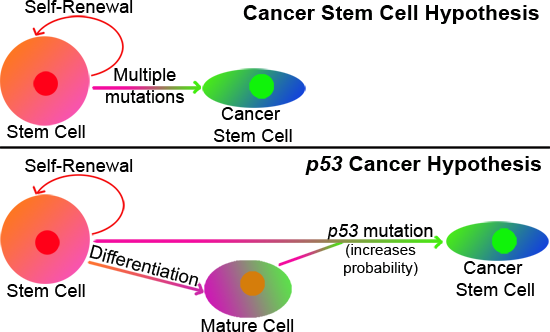 Running counter to this (bottom), some evidence suggests that a mutation in p53, causing it to no longer function, in any given cell (including, but not only, stem cells) may greatly increase the cell’s potential to initiate a cancer. p53 is not the only cancer-related factor important for the creation of iPSCs; most of the reprogramming factors have actually been suggested to be oncogenes and implicated in the generation of different cancers. C-Myc is a widely-used iPSC reprogramming factor (Takahashi et al., 2008) and is also responsible for the regulation of a very large number of different genes within the cell, including controlling cell proliferation. When c-Myc is over-expressed, or expressed at higher levels than normal, it can cause cancer, and high levels of c-Myc have been detected in many different tumor types (Hermeking, 2003). Other studies have shown that all the other reprogramming factors may also be oncogenes, with one exception (Lin28, which has been shown to not even be required for iPSC generation) (Liu, 2008A). But is this really that surprising? The reprogramming factors are genes expressed in embryonic, pluripotent tissues that are thought to be involved in making the tissue pluripotent. The cells that create cancerous tumors are most likely multipotent, being able to become multiple different cell types, because tumors are heterogenous tissues. Consequently, it is not that surprising that researchers have found connections between these embryonic reprogramming factors, and other embryonic-specific genes, and the creation of tumors and cancer stem cells (Wong et al., 2008; Gunaratne, 2009). While such reports have caused some researchers to label iPSCs as “man-made cancer stem cells” (Liu, 2008B), it is important to keep in mind the distinct differences between iPSCs and cancer. iPSCs indeed, by definition, can create teratoma tumors when injected into animals and express many embryonic proteins which allow them to differentiate into multiple cell types just like tumors can. However, unlike cancer, iPSCs are grown in laboratories under controlled settings and it is only when they are undifferentiated that they have these tumorigenic potentials. To be used in therapies all cells must be carefully differentiated to the desired, adult cell type. iPSCs must lose their multipotency and consequently their tumorigenic potential. Researchers are currently working on many ways to make iPSCs safer for therapeutic use: using p53 to select for iPSCs that have no introduced DNA damage (Kawamura et al., 2009), optimizing the purification of differentiated populations, improving transient expression of the reprogramming genes, and more. Aside from therapies and regenerative medicine, iPSCs have great potential for creating cellular disease models, creating cell lines from reprogrammed diseased tissue to allow for greater study in laboratories; cancer cells cannot do this in the same fashion. Despite their similarities, iPSCs have the ability to offer scientists many important research opportunities that studying cancer by itself does not. Understanding the connections between iPSCs and cancer has great potential for improving our treatment of cancer. Because iPSCs are reprogrammed adult cells, it may be possible to think of tumors as reprogrammed adult cells as well. Since iPSCs can be differentiated into specific, desired cell types, some researchers think it may also be possible to differentiate tumors into non-malignant cell types. However, the human body is a much more complicated environment than cells in a controlled laboratory setting (Blelloch et al., 2004; Yang et al., 2008). To potentially improve our abilities to treat cancer, it will take a great open-mindedness and understanding of not only the behavior of these cells in the laboratory, but also of their possible similarities to cancer initiation as it occurs in an organism. Blelloch, R. B., Hochedlinger, K., Yamada, Y., Brennan, C., Kim, M., Mintz, B., Chin, L., and Jaenisch, R. Nuclear cloning of embryonal carcinoma cells. PNAS. 2004. 101(39): 13985-13990. Dolgin, E. Immortality improves cell reprogramming: Knocking out genes with a role in cancer prevention helps produce stem cells. Nature News. 2009. Gunaratne, P. H. Embryonic Stem Cell MicroRNAs: Defining Factors in Induced Pluripotent (iPS) and Cancer (CSC) Stem Cells? Curr Stem Cell Res Ther. 2009. Hermeking, H. The MYC Oncogene as a Cancer Drug Target. Current Cancer Drug Targets. 2003. 3(3): 163-175. Hong, H., Takahashi, K., Ichisaka, T., Aoi, T., Kanagawa, O., Nakagawa, M., Okita, K., and Yamanaka, S. Suppression of induced pluripotent stem cell generation by the p53-p21 pathway. Nature 460, 1132-1135 (27 August 2009). Kawamura, T., Suzuki, J., Wang, Y. V., Menendez, S., Morera, L. B., Raya, A., Wahl, G. M., and Izpisúa Belmonte, J. C. Linking the p53 tumour suppressor pathway to somatic cell reprogramming. Nature. 2009. 460: 1140-1144. Li, H., Collado, M., Villasante, A., Strati, K., Ortega, S., Cañamero, M., Blasco, M. A., and Serrano, M. The Ink4/Arf locus is a barrier for iPS cell reprogramming. Nature. 2009. 460: 1136-1139. Liu, S. V. iPS Cells: A More Critical Review. Stem Cells and Development. 2008A. 17: 391-397. Liu, S. V. IPS Cells are Man-Made Cancer Cells. Logical Biology. 2008B. 8(1): 16-18. Utikal, J., Polo, J. M., Stadtfeld, M., Maherali, N., Kulalert, W., Walsh, R. M., Khalil, A., Rheinwald, J. G., and Hochedlinger, K. Immortalization eliminates a roadblock during cellular reprogramming into iPS cells. Nature. 2009. 460: 1145-1148. Vazquez, A., Bond, E. E., Levine, A. J., and Bond, G. L. The genetics of the p53 pathway, apoptosis and cancer therapy. Nature Reviews Drug Discovery. 2008. 7: 979-987. Wong, D. J., Liu, H., Ridky, T. W., Cassarino, D., Segal, E., and Chang, H. Y. Module Map of Stem Cell Genes Guides Creation of Epithelial Cancer Stem Cells. Cell Stem Cell. 2008. 2(4): 333-344. Yang, Y., Zhang, L., Wei, Y., Wang, H., Fukuma, M., Xu, H., Xiong, W., and Zheng, J.
Neural differentiation arrest in embryonal carcinoma cells with forced expression of EWS-FLI1. Journal of Neuro-Oncology. 2008. 90(2): 141-150. Zhao, Y., Yin, X., Qin, H., Zhu, F., Liu, H., Yang, W., Zhang, Q., Xiang, C., Hou, P., Song, Z., Liu, Y., Yong, J., Zhang, P., Cai, J., Liu, M., Li, H., Li, Y., Qu, X., Cui, K., Zhang, W., Xiang, T., Wu, Y., Zhao, Y., Liu, C., Yu, C., Yuan, K., Lou, J., Ding, M., and Deng, H. Two supporting factors greatly improve the efficiency of human iPSC generation. Cell Stem Cell. 2008. 3(5): 475-9.
admin	Cancer Stem Cells, Embryonic Stem Cells, Induced Pluripotent Stem Cells	adult, cancer, embryonic, news, regenerative medicine	© 2009-2010, Teisha Rowland. All rights reserved. I would like your opinion on a frequent finding in purified pripheral blood mononuclear cells (PBMNCs) obtained at baseline in patients with non-small cell lung cancer. The same genetic abnormalities by FISH are found in both CD45 negative and to a far lesser degree in CD45 positive PBMNCs. The genetic abnormalities in the PBMNCs are highly correled with the subsequently resected lung cancers. Could you postulate that a circulating tumor stem cell derived from the primary cancer could undergo differentiation into a CD45 positive cell in the blood or bone marrow accounting for this finding? extrapolating the numbers of these cells based on PBMNC counts and volume of blood collected resulted in up to 100,000 cytogenetically abnormal cells per ml of blood collected. This phenomenon was consistent in over 60 patients with lung cancer and was significantly different compared to controls. Thanks for reading and for your interesting question raised. I am not an expert in this particular stem cell field, but here are my thoughts on your observations. Stem cells change expression of their surface markers (i.e. CD45) as they differentiate, and cancer stem cells in particular most likely have a marker expression profile very different from their progenitor cells. I wrote more about cancer stem cells and surface marker profiles in a previous post, “Cancer Stem Cells: A Possible Path to a Cure.” It’s possible these genetically abnormal PBMNCs started out CD45 negative and became CD45 positive (since fewer are positive with the abnormalities), as you suggest. It would be interesting to see if there are more CD45 positive or negative cancer stem cells within the lung tumor itself. Thank you again for the interesting comment. By better understanding cancer stem cells, where they come from and how they lead to cancer, we can learn how to deal with them more effectively.